You-Pick at Red Fern Farm is by reservation only. You can call a day ahead to see if there is an opening or schedule your harvest day weeks in advance. We have lots of openings on weekdays, but weekends fill up quickly. Back of car after an afternoon of gathering chestnuts ( and other treats) at Red Fern Farm. What to Expect: You can usually drive up and park close to the spot you will be harvesting. We have clean latrines, hand washing stations and picnic tables at each parking area. This is a safe area for children, but no dogs or cats are allowed (food security issues). The grass will be mowed, but not as fine as a lawn. Be sure to wear sturdy shoes, prickly chestnut burs are scattered on the ground. Our orchards are in a rural setting, close to “wild” timber. Bring bug repellent. Your children are welcome to observe and catch the frogs, insects, spiders and snakes they encounter. Please ask your children to be gentle and release all creatures before you leave the groves. Aronia Berries: (Done for 2018) Aronia berries are available free for you-pick. They will hit the peak of ripeness during early September. We only have a few bushs still bearing fruit. They are located in the shade of chestnut and heartnut trees. Call for more information. Hazels: (Done for 2018) Hazels are available at $1.00/pound for un-husked clusters for you-pick. The season for hazels starts in late August and continues to mid-September. Hazels can be picked from the bushes or from the ground underneath. Bring bags, buckets or boxes to collect into. 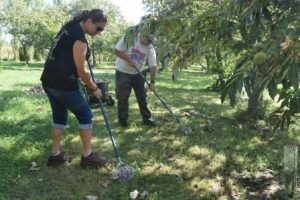 It can take 30 minutes for one adult to pick clean one 10 foot tall bush and gather about 1-3 gallons of hazel clusters. 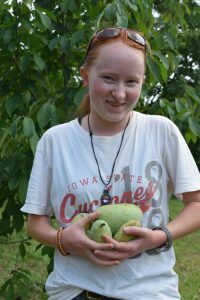 Theresa Wahldice holds 4 large pawpaws in pawpaw grove at Red Fern Farm. Pawpaws: (Done for 2018) Pawpaw season runs from late August to late October. Pawpaws are $3.00/pound when you pick them, $5.00/pound when we pick them. Bring buckets, boxes or crates. Ripe pawpaws are very soft and should not be stacked no more than 2 deep. Weekends are very popular, so call early to reserve a time slot. Tuesday – Thursday is an excellent time to have the pawpaw patch to yourself. It only takes about 15 minutes to get 5 – 10 pounds of pawpaws. Late afternoon is the best time to pick, but ripe pawpaws will be available all day. Recipes are available. There is no minimum or maximum for the amount of pawpaws you pick. We do ask you only pick what you plan to take home. We have many grafted trees. If you want to see what grafted variety you like the flavor of best, bring a black sharpie with you. You can write on the outside of the pawpaw what the variety it is. When you eat it later, you can compare it with other varieties. American Persimmon: Persimmons are available at $2.00/pound when you pick them, $3.00/pound when we pick them. The season starts in early September and continues to mid-October. Persimmons are very soft when ripe. They should not be piled deeply in your gathering container. Bring bags, buckets or boxes to collect into. They can be gathered from the ground or picked from the tree. Slightly under ripe persimmons are very astringent. They will ripen at room temperature if picked early. We have nets spread under grafted persimmons in front of our house. You are welcomed to gather from the nets, the trees or anywhere in our groves. Heartnuts: Heartnuts are available at $2.00/pound for un-husked clusters or $4/pound without husks (they husk very easily) for you-pick. The season for heartnuts starts in early September and continues to mid-October. The nuts are gathered from the ground under the trees. Theresa Wahldice lady holds 4 large pawpaws in pawpaw grove at Red Fern Farm. Three ripening Cornelian cherries on grafted bush. 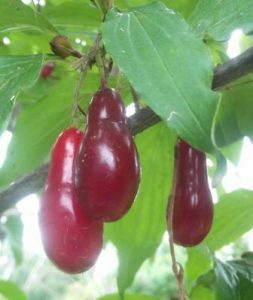 Cornelian Cherries: (Done for 2018) Cornelian Cherries are available at $2.00/pound for you-pick. The season has been mid-August to mid-September. We recommend bringing a gathering cloth to spread under the bushes. The ripe berries are soft and sweet. Under ripe they are firmer and very tart. They will continue to ripen after picking. We have none available already picked (the family eats them up too fast). Spicebush:(Done for 2018) Spicebush berries are available for $8.00/pound or 50¢/ounce for you-pick. The season runs from early September to mid October. (Tom reported ripe, red berries on 9/7/17.) You only need a few ounces of these potent berries to add to a variety of recipes. Kathy uses them in pawpaw jam and persimmon margaritas. 3 Chestnuts in opening bur. 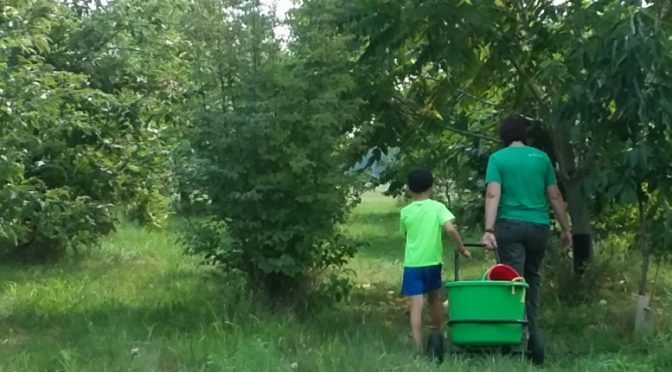 Chestnuts: (only small amounts left for 2018) We offer you-pick under our chestnut trees. The season often runs mid-September to mid-October. We provide tools and buckets for harvest and designate an area all your own to pick for a day. We weigh and bag your nuts afterwards. Be sure to wear sturdy shoes, prickly chestnut burs are scattered on the ground. The best time of day to gather chestnuts is mid to late afternoon. Plan on coming after lunch and harvest up till sunset. We have a very long waiting list of people who want to gather chestnuts on weekends. If you are new to our You-Pick, your name goes to the bottom of the weekend list. 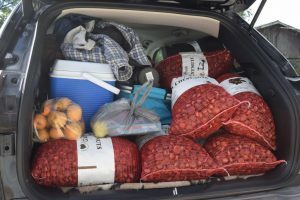 If you can only come on a weekend, it may be years before you get a chance to gather chestnuts. If you can come on a Tuesday, Wednesday or Thursday you have a much better chance of getting to gather chestnuts. We have started scheduling people to come pick chestnuts on weekdays for 2018. Call or email us to get on our list. We can schedule you now for weekdays or call you when other dates open up. Husband and wife team gather chestnuts with nut wizards provided by Red Fern Farm. If you want to keep all the nuts you pay $2.75/pound for everything you picked up. If you don’t want all the nuts, we will pay you 50¢ for each pound of chestnuts you gather and don’t take home. Be sure to bring water and snacks. It takes about one hour for one adult to gather 25 pounds of nuts. Maps and directions are available or call if you need help finding us. We are outside a lot this time of year. Be ready to leave a message. We need to schedule a day for you to come and harvest chestnuts. Then we will send an address. Barbara, We don’t have a list for Cornelian Cherries (which are ripe right now). For nuts, we have lists for hazels, chestnuts and heart nuts. Which would you like to be on? Do you ship pawpaw fruit? Jo, yes we do ship pawpaws. We charge $5/pound and the shipping cost – about $15 for 1 – 10 pounds of pawpaws. I’m glad you enjoyed the chestnuts you have harvested so far on your own trees. I’ve added you to our you-pick chestnut list. When the chestnuts start dropping, I will send out an email to everyone on the list. If you don’t see it, feel free to call or email about the middle of September. We can schedule you for a weekday of your choice (as long as it is still not too crowded). Are the Cornelia cherries still available? Are hazels still available? 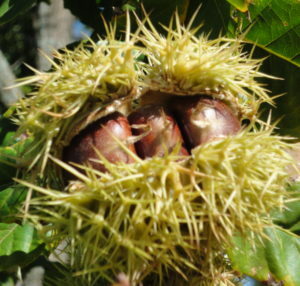 Do you still have available times to pick chestnuts, heartnuts & hazels? Are persimmons ready? What are your hours? I want to be on a list for all nuts.